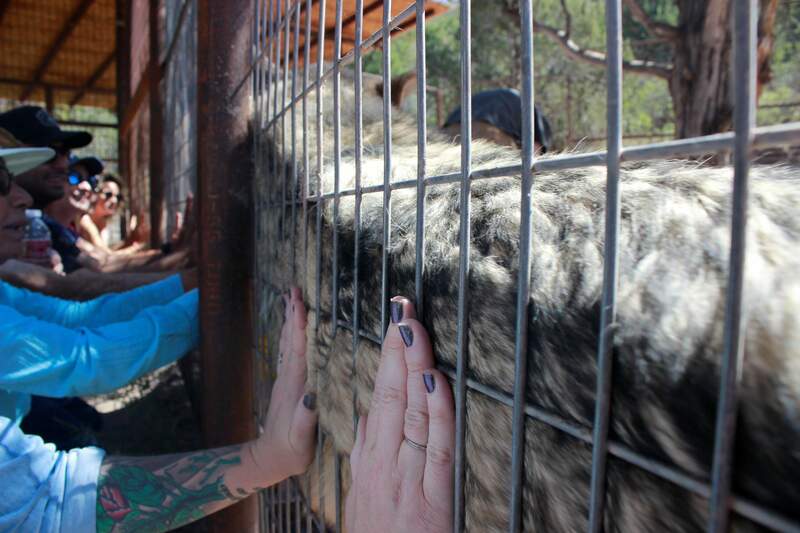 Chaco, a male wolf dog from Ohio, enjoys being petted by visitors of Wolfwood Refuge. 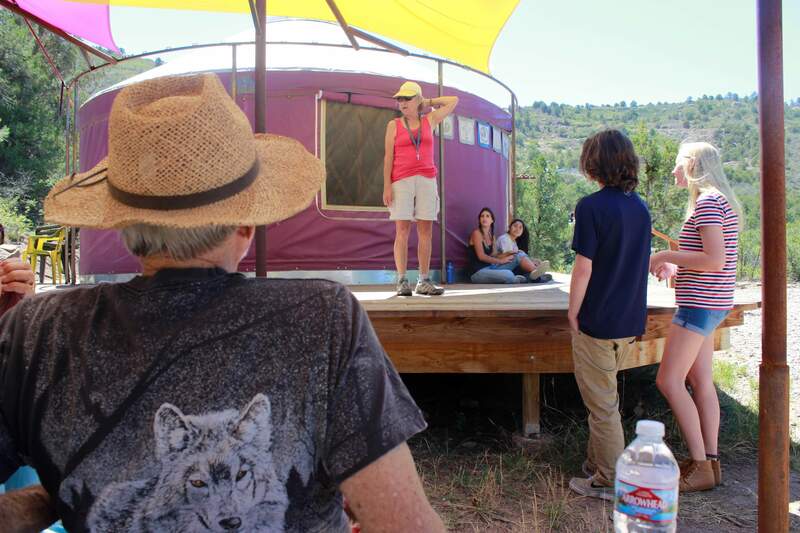 Lynne Matievich, a volunteer at Wolfwood Refuge, speaks to visitors before a tour of the wolf and wolf dog refuge. 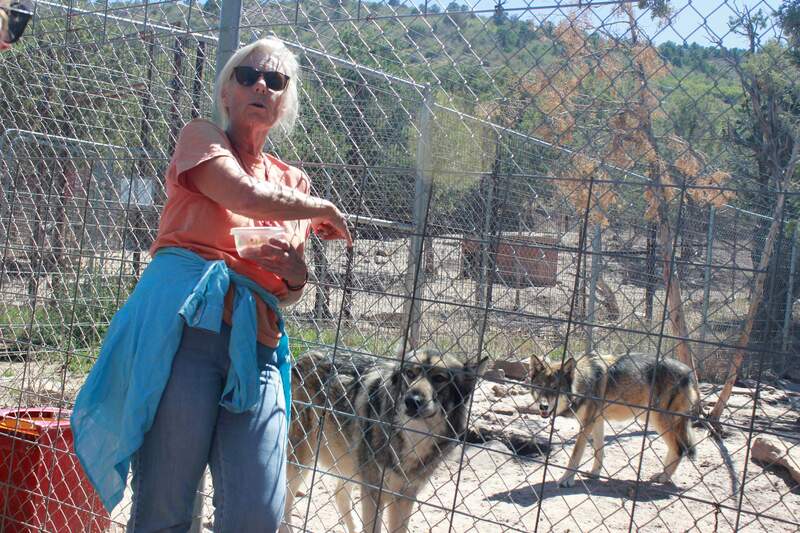 Paula Woerner, who runs Wolfwood Refuge, explains the differences between wolves and dogs next to Chaco and Liri, two wolf dogs who live at the refuge. The pair are bonded. Paula Woerner feeds the Alaska 9 wolf pack treats after they finish their visit with the Wolfwood Refuge guests. Members of the Alaska 9 wolf pack eagerly jump against the fence to get their treats from Paula Woerner who runs Wolfwood Refuge. Oakley, the alpha of the Alaska 9, is the largest of the pack. On his hind legs, he stands at about 7 feet tall. Oakley is one of the traveling ambassador animals for Wolfwood Refuge. 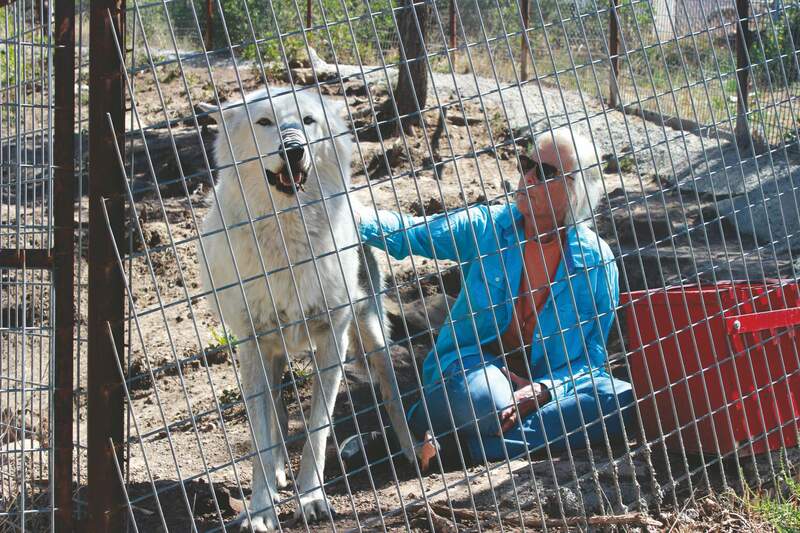 Paula Woerner sits with Ra, a wolf that was rescued from Alaska. He lives with his sister, Tala. Ra considers Woerner to be his mother. 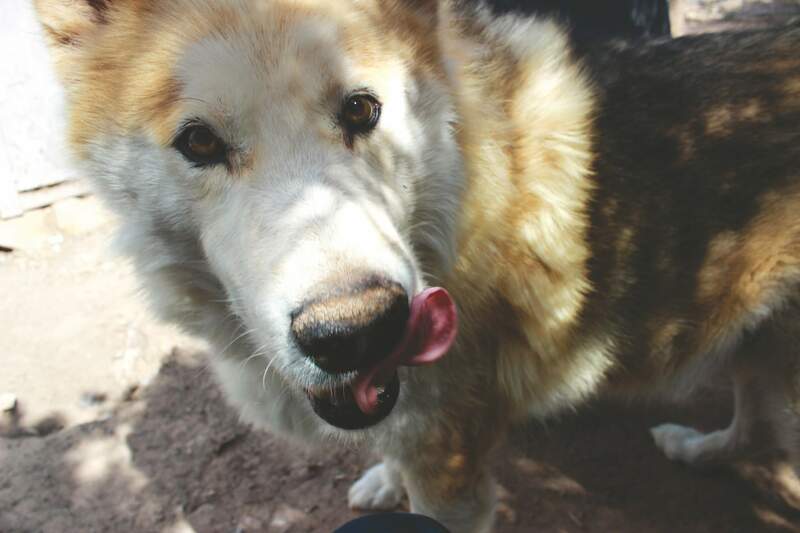 Kodiak, a wolf dog, loves the attention he gets from visitors at Wolfwood Refuge. He and Jill, the wolf dog he lives with, were rescued from a warehouse where animals were kept in crates stacked on top of each other. 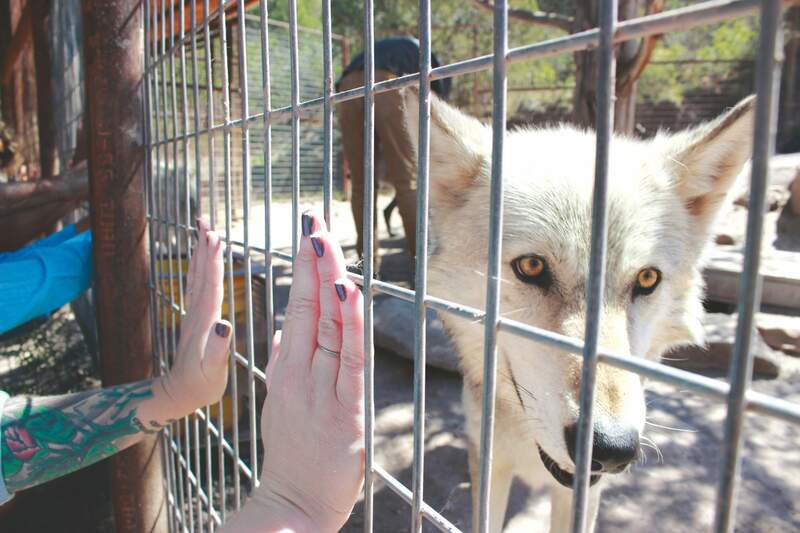 Jill, left, and Kodiak greet a visitor to their pen at Wolfwood Refuge. Jill and Kodiak are wolf dogs and were rescued together. The midday sun is menacing, and it beats down relentlessly on the small group of people as they make their way up the hill toward the sound of high-pitched howling. One man – an older gentleman in a gray wolf t-shirt – trudges halfway up before abruptly turning back toward the purple yurt. Too high, he says, and no, he’s not interested in a ride. It would be easy to follow suit. It’s hot out on the hill in Ignacio, and the climb is steep. There are dozens of reasons to stick it out, though. At the top of the climb, the wolves of Wolfwood Refuge await their arrival. It’s there that they’ll come face to face with Dante, a wolf dog that arrived from New Mexico covered in parasites, and Abra, a wolf dog from Montana whose owner kept her locked in a crate without water. There’s Aldo and Archie, and a pack called the Alaska 9, which arrived at the refuge when they were just a few weeks old. There’s also Oakley, a full-blown wolf that’s 7-feet tall when he stands on his hind legs. He towers over the volunteers as he clamors against the fence for a treat. By the time these visitors head back down the hill, they’ll be covered in not only sweat, but wolf hair, slobber, and the smell of puppy breath. Wolfwood Refuge is located at an elevation that is more than 7,000 feet. 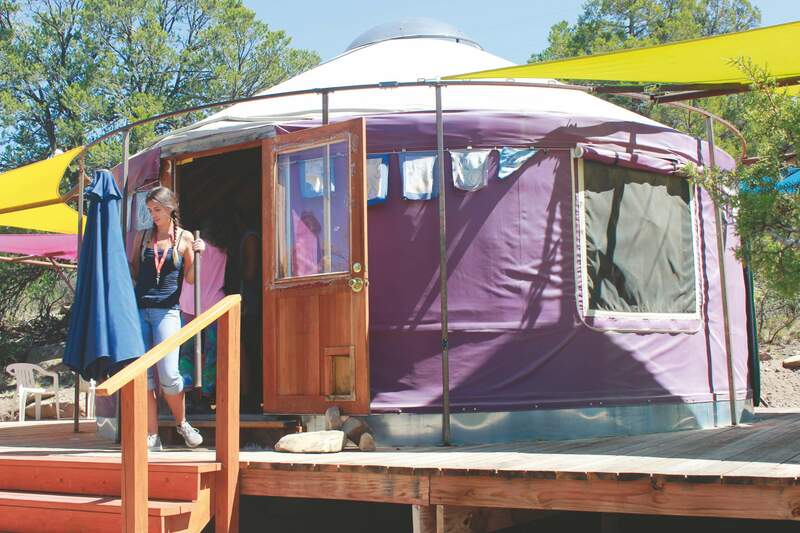 After a drive down dirt roads, visitors meet at a purple yurt to await their two-hour tour. 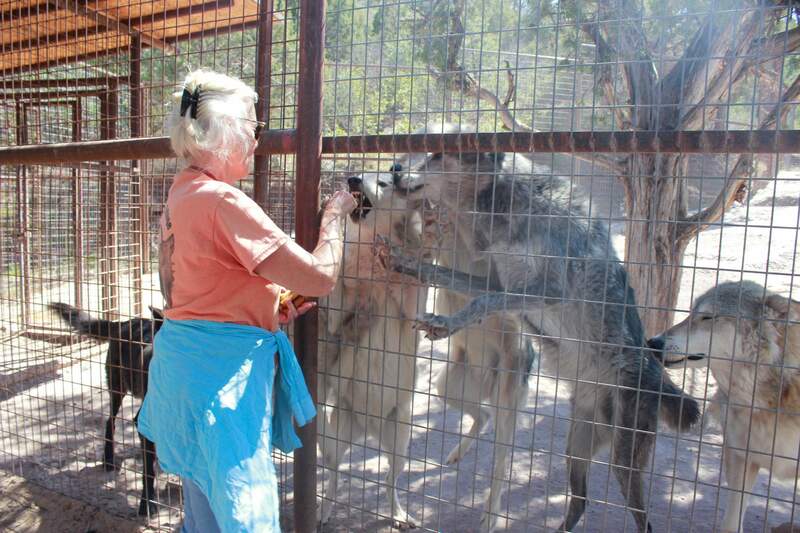 Woerner has been taking in full-blooded wolves and wolf dogs for the last 25 years or so. 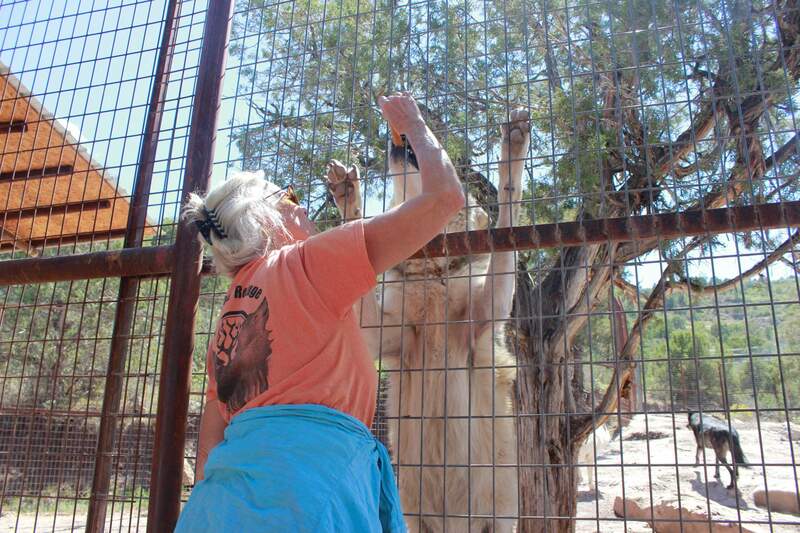 Her work at the refuge is necessary due to a thriving market where “wild” or exotic animals are in high demand. That includes the wolf dog, the offspring of a wolf and a domesticated dog, an animal that is sought after as a pet by private citizens. And where there’s a demand, there’s a market full of breeders trying to capitalize on it. Whatever the driving force, one thing is clear: breeders specializing in wolf-dog hybrids are everywhere. A quick Internet search by DGO yielded hundreds of classified ads hawking wild, high-percentage wolf dog puppies for sale, and several of those breeders were in western Colorado. Their prices ranged from $800 to $1,500, and are driven by how much wolf the dog contains, even if there’s no scientific way to tell what that percentage is. The higher the wolf percentage, the higher the price. “You can buy them off the Internet for $2,000, or you can buy them out of the trunk at a swap meet for $50, but just don’t do it,” Woerner said. 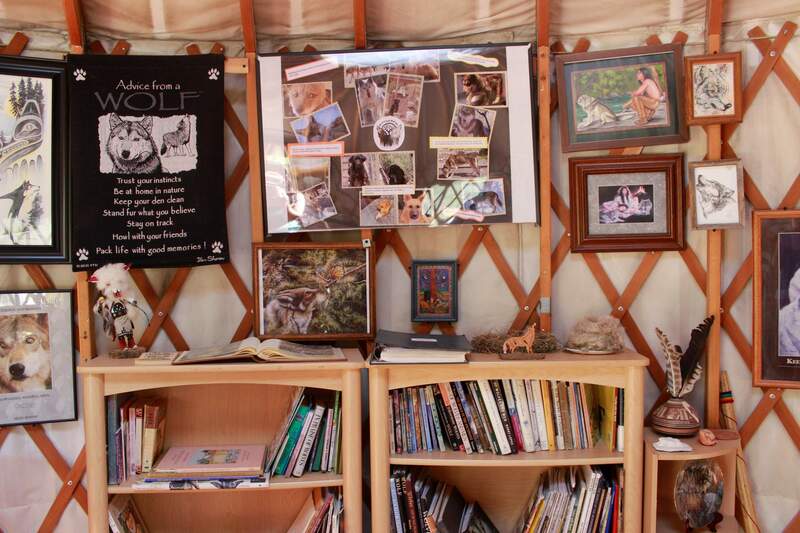 Inside the purple yurt visitor center at Wolfwood Refuge is wolf paraphernalia that guests can browse through as they await their tour of the facility to begin. Ethics vs. legalitiesIt’s completely legal to breed and buy wolf dog hybrids in Colorado. There have been attempts at a ban – in 1997, the state legislature of Colorado considered a bill that would have banned wolf hybrids in the state – but it flailed and then died after wolf dog owners and breeders spoke out against it. For the most part, wolf dogs are restricted only by dangerous dog laws. But just because dogs and wolves can reproduce – and just because breeders can legally sell them – doesn’t mean they should. “One of the many, many reasons that wolves don’t make good pets is (that) wolves treat people exactly like they treat each other. They are very physical with each other. They’re very physical with us; there is no such thing as sit and stay,” Woerner said. Part of the issue is that wolf behavior is driven by instinct – they are wild animals, after all – and crossing a wild wolf with a domesticated dog doesn’t make them a suitable pet. Most wolf dogs are tough to control. They ignore commands, but are agile, athletic, and full of energy, which can lead to destructive behavior. They have been known to chew through wooden fences, or jump them, or dig under them, much in the way that wolves dig dens in the wild. Even the most well-behaved wolf dog needs constant attention, Woerner said. And things can easily go awry, even when the animals – which have extremely strong jaws from the wolf genetics – are simply trying to play. “Ra broke my hand as a baby just playing with me. He didn’t break my skin. But he broke my bones, so we don’t get them excited,” Woerner said. There was also an incident where one of the wolves put a volunteer’s head in its mouth while she was trying to clean its enclosure. It didn’t hurt her, Woerner said, but it’s evidence of why interacting with wolf dogs requires more than the average person can offer. Most wolf dogs simply cannot be trained or socialized to the point where they’ll be safe to keep in a home. 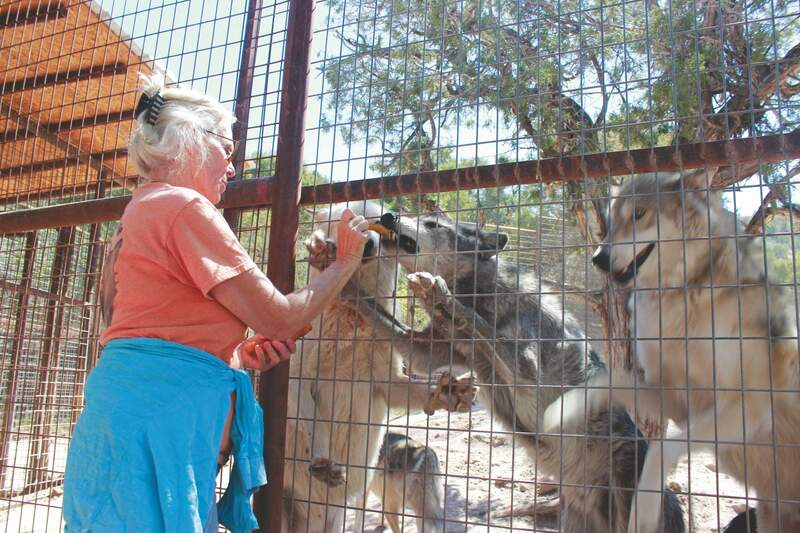 Paula Woerner feeds Chaco, a wolf dog at Wolfwood Refuge. Chaco is from Ohio and is very social. Humans as predatorsWhile the stories of wolf dogs hurting humans make headlines, they’re few and far between. Far more often the stories involve the horrific treatment of wolf dogs by humans instead. “We got a call from the humane society (asking us to take a dog). They said, ‘He won’t eat; he shakes and he growls. Will you take him?’ So I took him to my vet, who said, ‘There’s nothing physically wrong with him.’ (It turns out) he was beaten when he ate and associated food with pain,” Woerner said. It took offering the abused pup hamburger day after day to get to the point where volunteers could teach him how to eat. And, as harrowing as that story is, many of the refuge’s wolves and wolf dogs come bearing stories just like it. “We got a call telling us they (rescue workers) had found one of our dogs’ sisters. They said, ‘We found her sister, but you’re not gonna want her, cause someone hit her with a bat and broke both of her front legs,’” Woerner said. The refuge gave her a home. 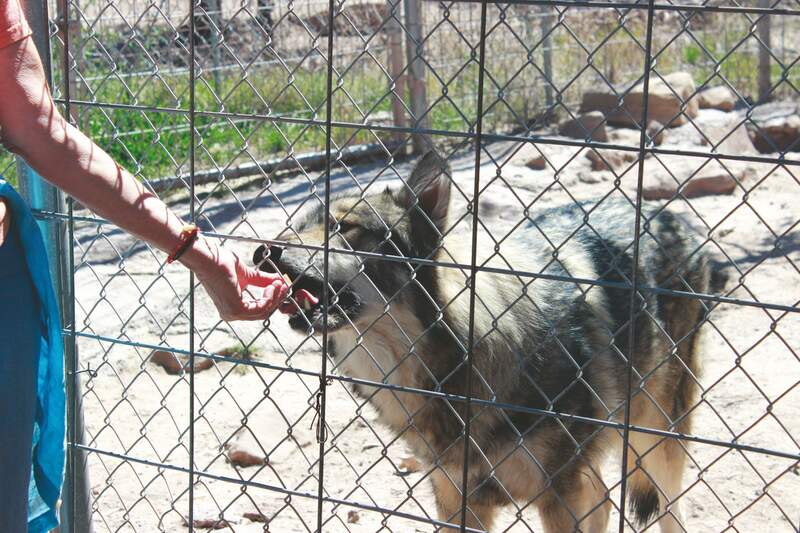 A volunteer for Wolfwood Refuge pets Chaco in his pen that he shares with Liri, another wolf dog. Shameful statistics Given the rampant abuse and neglect of wolf dogs, it’s not surprising that the statistics related to their life expectancy are abysmal. “The statistics for wolf dogs in captivity is really bad. Eight out of 10 end up dead before the age of two,” Woerner said. Part of the issue is that many of the traditional shelters can’t take on “wild” or exotic animals, even if they’re crossed with a domestic dog. Wolf dogs don’t have the instincts to make it in the wild, either. In many cases, the animals end up on death row to be euthanized, unless the shelters can find a wolf rescue to take them. That’s where Wolfwood Refuge comes in. The shelter takes in wayward wolves and wolf dogs from around the country and helps them build their own packs, assessing whether two wolves will clash or fit together like they would in the wild. Two female wolves almost never get along – the fight for control can turn ugly – but they all need a friend. There is no such thing as a lone wolf, Woerner said. Lone wolves die in the wild. 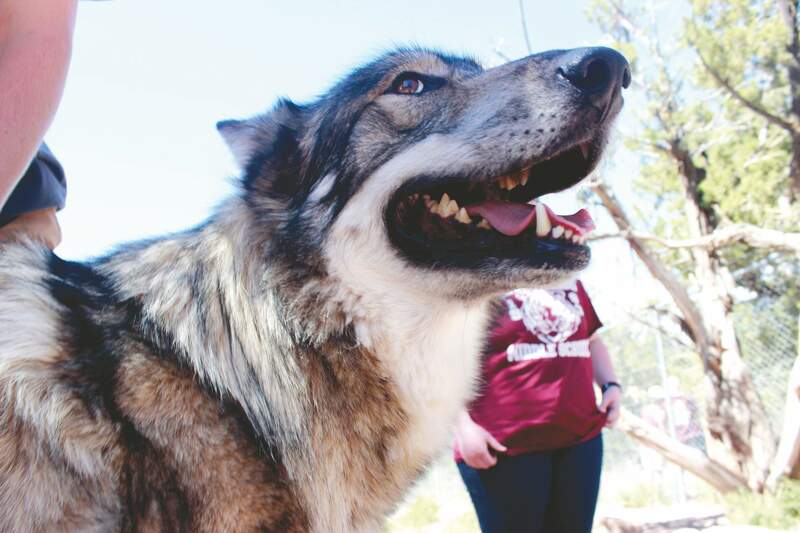 They also let visitors pet the wolves – Oakley prefers men to women, something the visitors to the refuge found out quickly when he turned away from the women who would crouch to greet him in his pen – to help educate the public on their wolf and wolf dog residents. To do so, curious onlookers can’t have loose clothes or shiny piercings – the wolves like to grab them with their teeth, and many a dress has been lost that way – or food, including gum. One volunteer learned that lesson the hard way when a wolf stuck its tongue down her throat and stole the gum right out of her mouth. Nothing like being greeted by a slobbery, warm wolf tongue. But while visitors can, and do, frolic with the wolves, the real goal of Wolfwood is to make sure these animals – including the dozens of full-blooded wolves who are housed among the wolf dogs – survive not only predators, but people, who are often the most dangerous threat to the crew. When Wolfwood first opened, protesters armed with rifles drove by the property on ATVs. Things are calm these days, but it’s still generally not safe to “release” or re-home these pups. Wolf dogs can’t survive in the wild – they don’t have the instincts full wolves do for survival – and the wolves likely can’t either. They’ve been acclimated to humans, and their pack is at the refuge, not in the woods. And Woerner isn’t exaggerating when she says these animals demand constant attention. It takes a team of volunteers just to keep the ones at the refuge fed, watered, and entertained. It can also take a team to load a sick animal onto a truck for a visit to the vet. Wolves don’t exactly have to cooperate if they don’t feel like it. “If (Ra) has to go to the vet and I’m not here, they’re (the volunteers) screwed. They’ll have to dart him because he won’t load in the truck,” she said. A member of the Alaska 9 wolf pack approaches the fence to greet visitors. The pack was rescued from Alaska as weeks-old puppies. 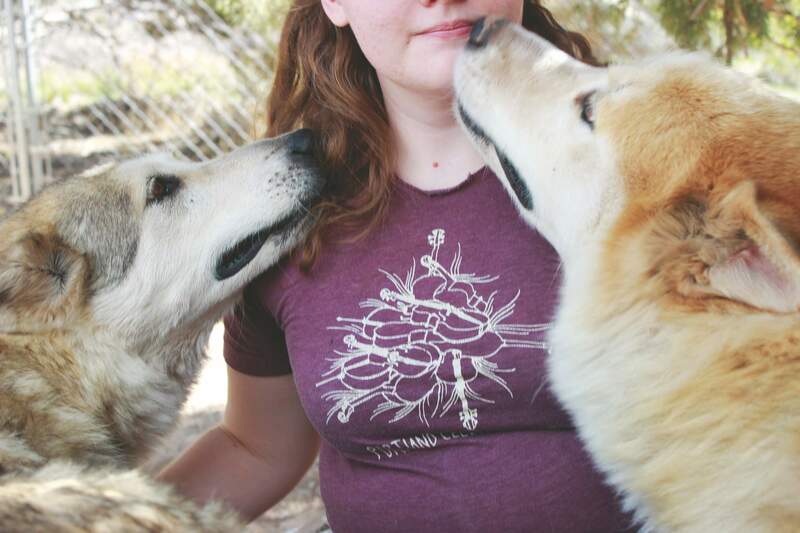 Accidental expertWoerner may be a wolf expert, but she didn’t go in to her first wolf dog rescue with the intent of building her life around a refuge. Woerner decided to take the wolf dog out of his pen, and he immediately leaned into her leg affectionately. So she loaded the wolf dog into her brand new Thunderbird – her first new car, she said – and drove him the 10 hours home, where he immediately knocked over her body-builder boyfriend out of excitement. Woerner eventually adopted another wolf dog as his friend, and things just continued from there. These days, there are 53 wolves and wolf dogs at Wolfwood, along with an unexpected, and recent, addition of 13 puppies that were rescued last week from a hoarding situation in Pagosa Springs. Woerner, who has spent the last 25 years taking in wolves, is a surrogate parent to all of them. “I did not move to Colorado at 40 going, ‘I know! 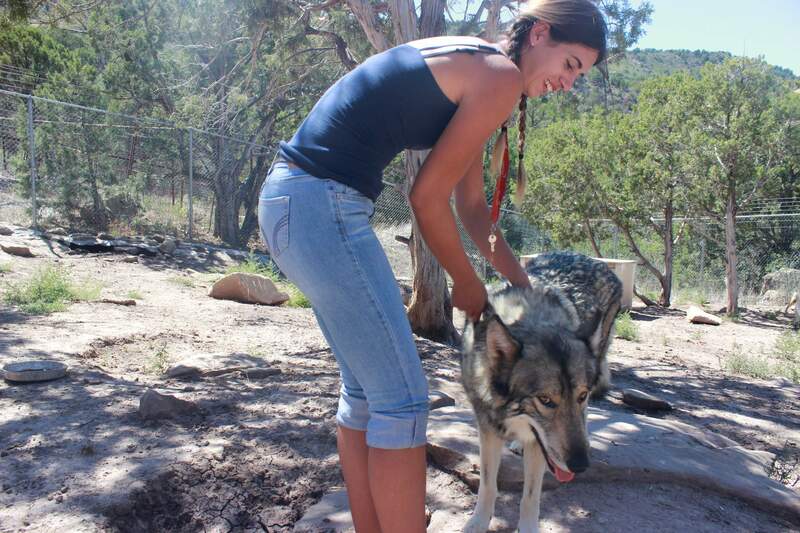 I’ll start a wolf rescue.’ But now it’s my whole life,” Woerner said. One of the members of the Alaska 9 wolf pack rubs up against the fence so visitors can pet it with their hands flat against the barrier. A liquid helloOne of the women in the group is crouched on her legs and backed up against the fence, the wolf dog leaning over into her face. He’s been licking her for what seems like an eternity, but it’s just the wolf’s way of greeting her. She allows it begrudgingly – it’s the price you pay to play – but grins broadly once he is finally coaxed away by a volunteer. Despite her tongue bath, she looks satisfied with her encounter as she makes her way out of the enclosure. Another visitor waits impatiently, ready for his meeting with the mutt, tongue – and liquid greeting – be damned. A volunteer gives him a quick lesson on wolf etiquette before letting the two become acquainted. Woerner smiles as she watches their reactions before leaning in to give one last piece of advice.